“I could not have purchased these items on my own,” – earthquake survivor from central Nepal. Nar needed support after losing his means of generating income. Using a small plastic card with his photo on it to purchase seeds and manure was “strange and easy” for Nepali farmer, Nar Bahadur. His purchase at a local store using a newly-introduced technological approach to distribution was part of an aid organisation’s response to Nepal’s 2015 earthquakes. When Nepal’s central and eastern districts were hit by a 7.8 magnitude earthquake in April 2015 many people lost their homes and livelihoods. Nepal’s deadliest earthquake in 81 years reduced buildings and temples in the capital, Kathmandu to rubble. Seventeen days later, a 7.3 magnitude earthquake shook the east-northeast of Kathmandu; a double-blow to communities trying to recover from the first natural disaster. Mountainous rural areas with poor infrastructure were impacted greatly. As well as damaged or destroyed homes, many farmers lost crops and livestock. Irrigation canals – essential to crop success – were damaged. Nar’s district of Sindhupalchowk, in central Nepal, was one of the hardest-hit areas. Some 97% of homes were destroyed. Farmers were particularly vulnerable after the earthquake, with many losing all they had. Nar’s home was destroyed, farming tools damaged and his stored crop ruined. For the 82-year-old maize and potato farmer, the use of Last Mile Mobile Solutions (LMMS) technology in World Vision’s relief item distributions changed things for the better. From early 2016, Nar used a Humanitarian Assistance Card that contained basic personal information and an identification photo, and electronic cash to purchase various items from authorised traders in the local area. For the first purchase with his card, Nar was assisted by World Vision staff. He selected from a variety of seeds and tools displayed on the screen of a handheld smart device at the store. “I could not have purchased these items on my own,” said the earthquake survivor from central Nepal. Nar needed support after losing his means of generating income. In the past, Nar received food and other items a few times from aid organisations, and the process involved waiting for hours in a queue. This was when ‘pen and paper’ was used to document peoples’ details. This was when a standard set of relief goods was issued to all vulnerable people. 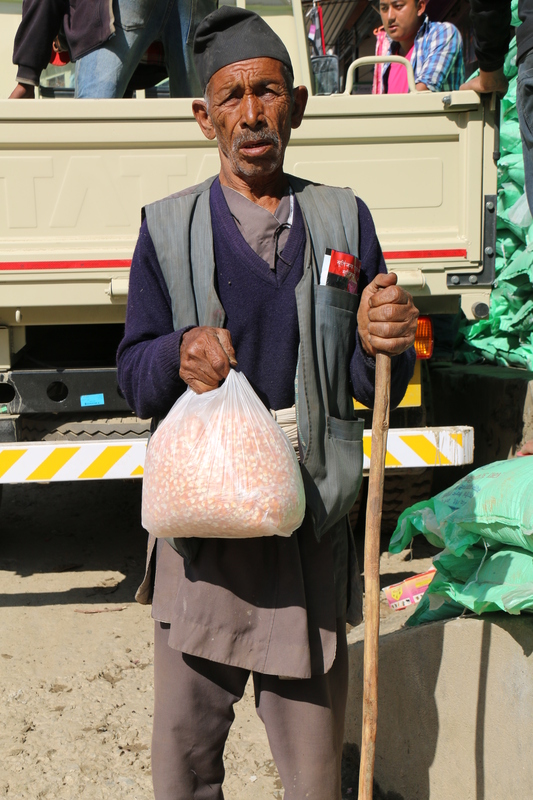 With the introduction of this technology for aid distributions, Nar chose what he needed and the quantity of supplies that suited him from a variety of agricultural items at a local store. During maize-planting season, Nar chose maize seeds and animal manure. With access to electronic cash points on his card, he only bought items he needed then. Surplus cash points remained on the card, so Nar only carried home the items he required immediately. “I will use it later when I want to purchase other seeds,” said Nar. In previous distributions, community members would have carried heavy loads of items. Using the LMMS system offered community members greater choice, more convenience and a dignified way to access items. The Last Mile Mobile Solutions system and approach benefited recipients of relief items during an emergency response, as well as local traders, local government entities and the organisations supporting communities. “The traders received enough time to stock the materials, and the transaction process was easy and appreciated by the vendor. Since the beneficiary and aid received were tracked in LMMS, it eliminated the risk for the traders financially, in case some beneficiaries claimed that they didn’t receive the aid,” said Namita Nepal, Resource Development Specialist, World Vision Nepal. To be selected for the LMMS program, traders must meet criteria including government registration, competitive bidding, and ability to supply quality goods of a particular quantity. For humanitarian organisations using the Last Mile Mobile Solutions platform, the benefits are multiple. Nar’s purchase information and personal details were securely stored on a database, helping World Vision with monitoring of programs and planning for future distributions. Internal and external reporting was improved when information could be accurately captured and stored. “It has led to effective, efficient, transparent and fairer aid distributions, better information management, and rapid reporting to donors and stakeholders. Rations and supplies were calculated and distributed with precision,” said Sarita Shakya, Business Analyst – World Vision Nepal. Information was stored on a central database and could be accessed by authorised staff across the aid organisation, whether in a remote area or a major city. Purchasing of relief goods, distribution planning and implementation, and monitoring of the program was made much easier with the LMMS system. Previously, relief item distributions required weeks or months of organising, large quantities were distributed over days, numerous staff required at one time, and some locations required security presence. Using the LMMS approach, the logistics around distributions looked very different, saving time and money for aid organisations. Distribution benefits for World Vision Nepal using LMMS system included reduced project costs, including staffing, reporting and actual distribution costs. From a risk perspective, LMMS’s data storage has a distinct advantage. “When a fire occurred in World Vision’s Sindhupalchowk office, none of the LMMS-recorded information was lost,” said Sarita. Aid organisations work collaboratively on various projects, so a tool that improved accountability, planning, and reporting meant greater efficiency and effectiveness. “The District Co-ordination Committee Office really liked our LMMS system when they had a visit during a distribution at Sindhupalchowk. They requested support for a pilot project for their regular cash distribution (Government Social Security) to elderly, single women, differently-abled, marginalised children and elderly people,” said Sarita. World Vision supported the local government to use the LMMS system to track and report information in one of their quarterly distributions of social security payments. In this one-off support project, 184 of the most vulnerable community members from the Balefi Rural Municipality in Sindhupalchowk received their payments. Agriculture – one of Nepal’s top income generators – was severely set back after the earthquakes of April and May 2015. Losses of between USD 255-284 million to the agricultural sector were estimated. Assisting farmers to recover at a faster pace was beneficial for individuals, families, local communities, and the nation. 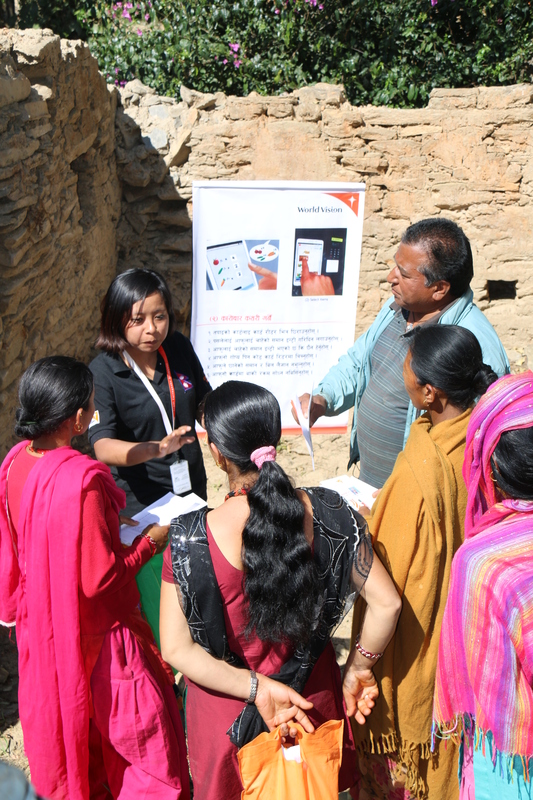 Nar is one of 500,000+ people assisted by World Vision in its earthquake response program across 10 districts in Nepal. The Last Mile Mobile Solution system was used in the majority of project locations for its cash-based programming focusing on livelihoods restoration. By the close of its 3-year earthquake response, approximately 189,000 people had benefited from the introduction of this technological approach to relief goods distributions. World Vision tracked relief and recovery items in distributions relating to its Livelihood, Shelter, Health, Education, and Water, Sanitation & Hygiene programs that occurred during the Nepal Earthquake Response (May 2015-April 2018). World Vision distributed school kits, student kits and blankets to 888 children in the Morang District, eastern Nepal, affected by floods of August 2017. 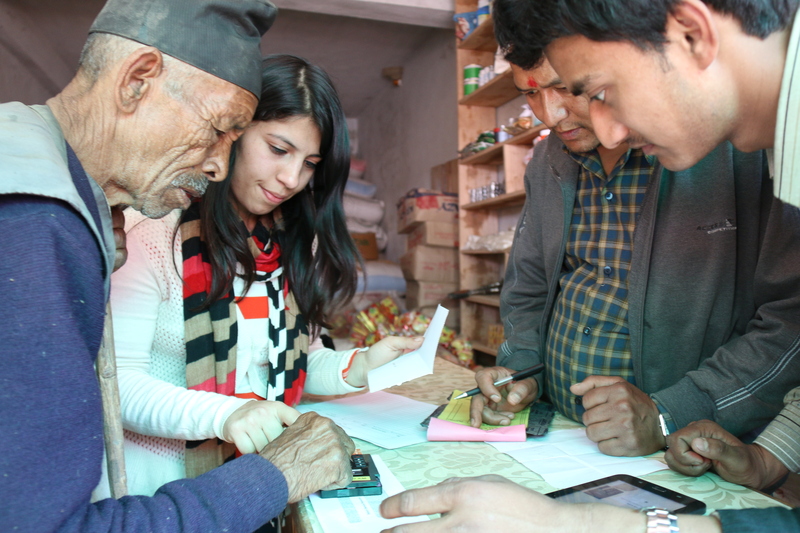 World Vision provided one-off support to the local government using LMMS to distribute its quarterly social security payments in Sindhupachowk district, central Nepal.